After suffering the first loss of his professional career, former UFC light heavyweight champion Lyoto Machida has called upon his old Brazilian buddy Anderson Silva to help him recapture his mojo. “The training in LA [is] very good. Anderson is helping me a lot with some new moves. I think [Satoshi Ishii] is coming to practice with us soon,” Machida recently Tweeted. MMA’s “Karate Kid” has been fairly quiet since getting knocked out by Mauricio “Shogun” Rua in their championship rematch at UFC 113 this past May. Although the 32-year-old thoroughly enjoyed his brief hiatus, he was anxious to get back in the Team Black House lab to hone his skills. 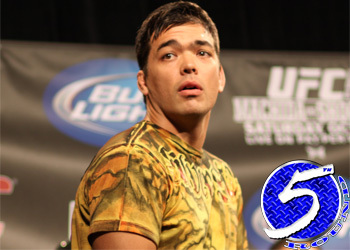 “He told me now he feels like a complete fighter,” Machida’s manager Ed Soares told MMAWeekly.com. “He knows what it’s like to win. He knows what it’s like to be a champion. And now he knows what it’s like to lose. Speaking of an Octagon return, when can we expect Machida to resume his nearly immaculate 16-1 mixed martial arts career? “The Best” is technically Shogun, but he’s going to be sidelined until March Madness 2011. Although, three consecutive title bouts between the same foes – in a division as deep as 205 – would be highly unlikely nonetheless. The rumor mill has been silesnt on the Machida front, so let’s see if it picks up some steam now that “The Dragon” is spitting hot fire once again.